This entry was posted in CTR, Google Adwords, Marketing, PPC, Retail, SEM, Small Business, SMB and tagged Advertising, adword, Adwords, Google, Google Adwords, Internet Marketing, Marketing, PPC, SEM, Small Business, SMB. Bookmark the permalink. This is absolutely shocking and I certainly hope this does not go into general release. This will penalise small advertisers like a little fish in a big pond and your point about bounce rates is crucial. Where did you see this ad – was it in the US? Yes, the article came from an affiliate marketer who lives in Atlanta, I believe. That doesn’t mean he wasn’t testing another country’s Google search results, as that is easily done, but at a glance I would say it’s in the US. Hmm – very disturbing. I’d call it “popularity” rather than “lemming”, though – there’s good psychology behind picking a popular choice. It reduces the users’ need to consider further factors, so it is a great shortcut for finding stuff you’ll probably find acceptable. However, that does tilt the playing field a lot… And Google has never gone for conversions as a measurement (too easy for the advertiser to manipulate). CTR would give too much detail about the bidding system… So as a popularity measure, about the only signal easily visible is clicks. As you say, well known brands (and usually larger players) will tend to accumulate more clicks. So… what other popularity signals *could* Google show, that weren’t subject to advertiser deception (conversions) but could signal the popularity that you’re suggesting? For example, if Google Checkout was used, that *could* provide an end-to-end conversion rate, a signal of popularity? 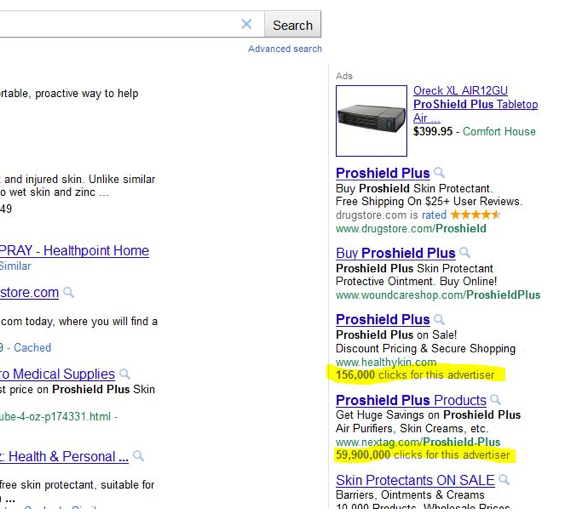 While Google Adwords is important for SMB, especially just starting out to get on the map and receive traffic. All websites need to be implementing all possible SEO tools at their disposal to increase their search engine placement gradually and eventually gain the benefits of free traffic. Dedication and hard work is a must in the world of online marketing. The ideal result is to slowly climb the search engine rankings with an established and noticeable website while maintaining a profitable PPC campaign simultaneously.